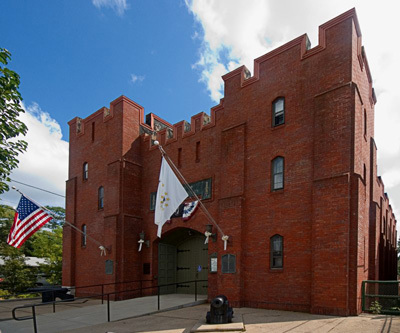 In 1913, just six years after their formation, the Varnum Continentals began construction of a medieval-style armory at the corner of Main and Division Streets in East Greenwich, RI. In the mid 1800’s, the site had been the location of the Rhode Island Central Bank, the first bank in the town. When completed about a year later, the armory included a 40′ by 110′ drill hall, meeting rooms, headquarters for “Varnum’s Regiment”, a chartered unit of the Rhode Island Militia, and a home for the organization’s respected collection of weaponry, uniforms, historic artifacts, and militaria. From 1918 to 1996, the State of Rhode Island leased a majority of the building to house units of the National Guard and (during World War II and the Korean War) the State Guard. The Varnum Armory is one of only a few armories not owned by the State to have housed a National Guard unit. During World War II, an aircraft spotter’s tower was located on the north tower part of a coastal early warning network operated by the US Army Air Corps and staffed by civilian volunteers. 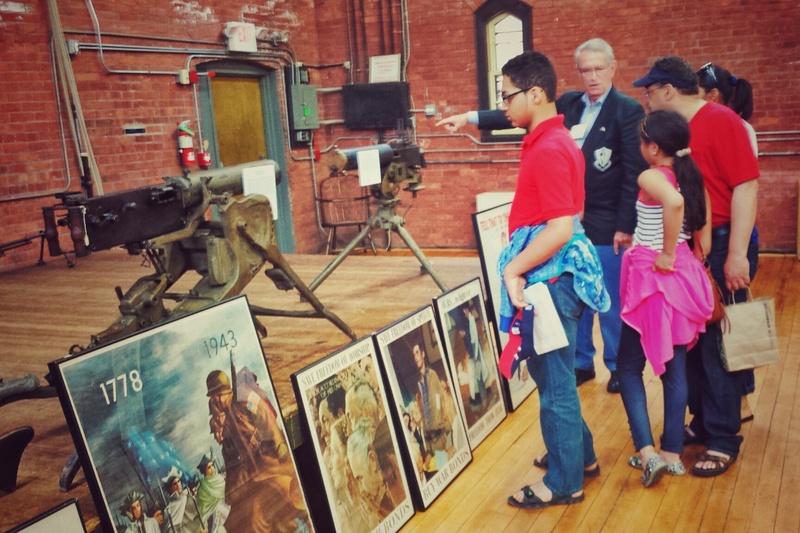 The armory drill hall has been the site of many public and private events over the years. In the early 20th century it was one of the only sites in East Greenwich capable of housing large community gatherings including banquets, dances, car and hobby shows and auctions. This practice was reinstated following the departure of the National Guard and the spacious mail floor hall remains available for rental (click here to rent armory facilities). 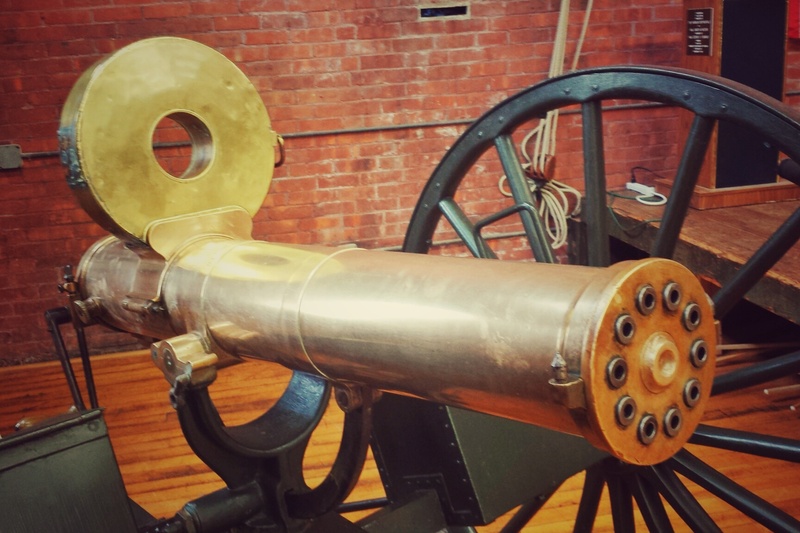 The Varnum Armory Museum includes representative examples of weaponry, uniforms and artifacts dating from colonial America and through the 20th century. 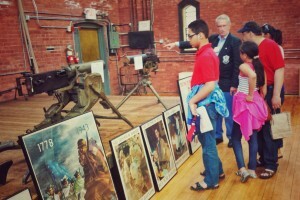 Among the more unusual items: a functioning 1883 Gatling gun, a Civil War era James Conversion six-pound rifled cannon, and a collection of more than 600 American and foreign patriotic and propaganda posters from World Wars I and II. 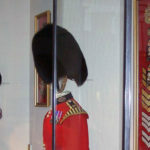 Visitors can view a variety of militaria including vintage sabers, flags and banners, a rare Revolutionary War leather helmet worn by a Rhode Island artillery officer at the Battle of Long Island and firearms ranging from colonial flintlock pistols and muskets (including a British carbine captured at the Battle of Saratoga) down to automatic weapons from World Wars I and II. Among the latter is a German Maxim machine gun and a Browning water-cooled .30 caliber machine gun, both from WWI. The museum’s unique displays offer scholars, students and history buffs a visible timeline of the evolution of weaponry and related materials, both American and foreign. As part of its mission to preserve the armory building (and Varnum House) and its treasured collections for future generations, the Varnum Continentals Board of Trustees has embarked on a strategic plan that includes an updated accessions and catalog policy, enhanced fund raising, volunteerism, educational initiatives, and membership development. In recent years, the trustees have addressed facilities preservation at the armory including a new roof, window replacement and newly completed state-of-the-art dehumidification and air handling system to preserve the museum collections. Further improvements are planned. At present, the Museum is open on special occasions and by appointment for school and small group tours (book a tour at the armory).